Sukhumvit Soi 38 x Chaffey Bros. In the short time that Sukhumvit Soi 38 has been opened, it has become well known for an ever changing seasonal menu made from locally sourced South Australian produce made in their kitchen from scratch. Soi 38 is also known for their wine list which are from small and medium South Australian producers. For the month of July, Soi 38 will be partnering with Chaffey Bros. by creating a 6 course lunch, pairing their food with Chaffey Bros. newest release wines. Adelaide Food Central, along with other guests, were invited to experience this special partnership with all food and drink being provided free of charge. 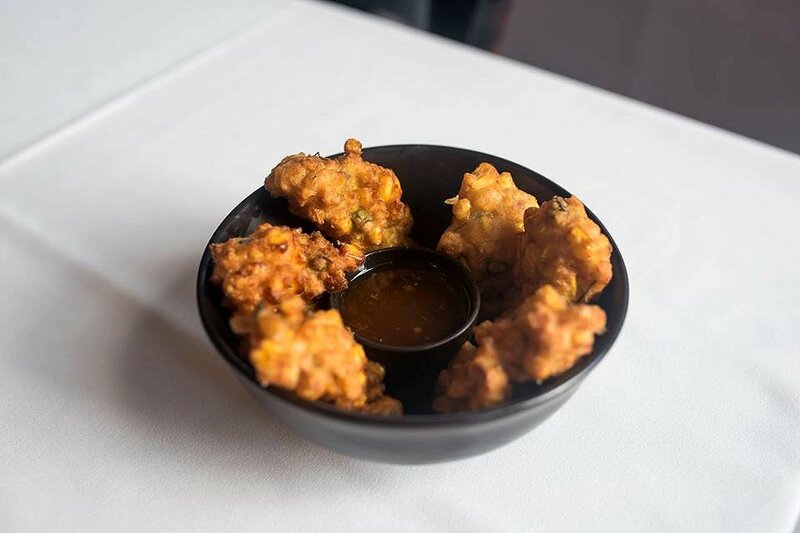 We start off with the Corn Fritters with house made sweet chilli sauce. This is paired with the Not Your Grandmas Rose Barossa 2016. The fritters were battered and fried to a light golden brown. The crispiness of the coating was complemented by the crunchiness of the corn kernels, and further balanced by the sweet chilli sauce. The flavours of red berry and strawberry in the rose further accentuates the dish. The Chive Cakes with dark soy, vinegar and chilli was paired with Not Your Grandmas Riesling Eden Valley 2016. 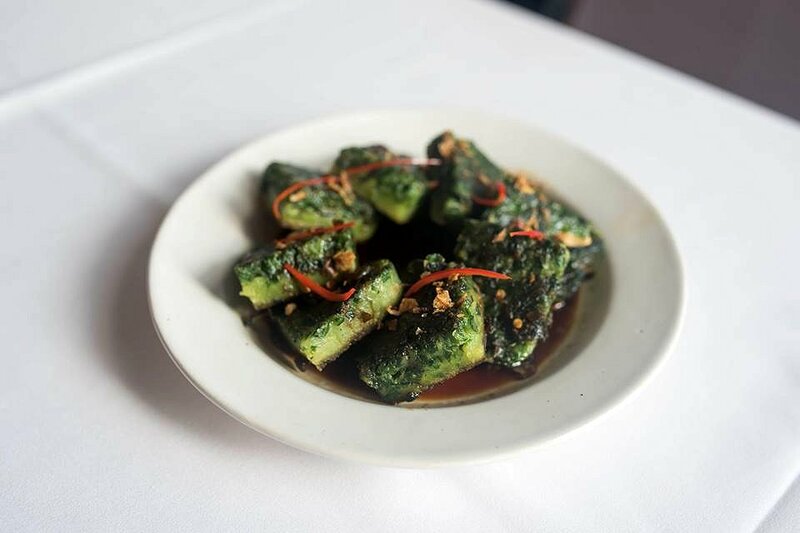 The Chive Cakes remind us of a popular Vietnamese dish with the exception of the green colour. The cake is firm and chewy, and balanced by the spicy sauce that it swims in. The taste of apple and lime in the riesling create balance with this dish. The Fresh Pomelo Salad is served with fresh chilli dressing and South Australian squid. Served like a San Choy Bow, the lettuce leaf is used as a cup to hold all the ingredients. The squid was well seasoned and cooked to perfection. 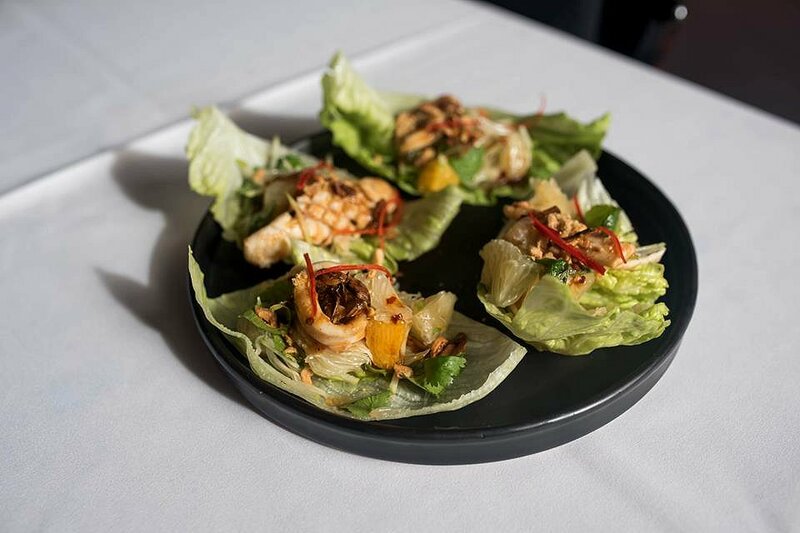 The spicy chilli dressing was balanced by the sweetness of the pomelo, and crispy texture of the fried onions worked well with the lettuce leaf. Paired with the Kontrapunkt Eden Valley Single Vineyard Kerner 2015, the pear, peach and citrus notes complement the sweetness of the pomelo perfectly. The Steamed South Australian King Prawns in Barossa Valley free range pork belly broth and glass noodles was paired with the Zietpunkt Eden Valley Single Vineyard Riesling. 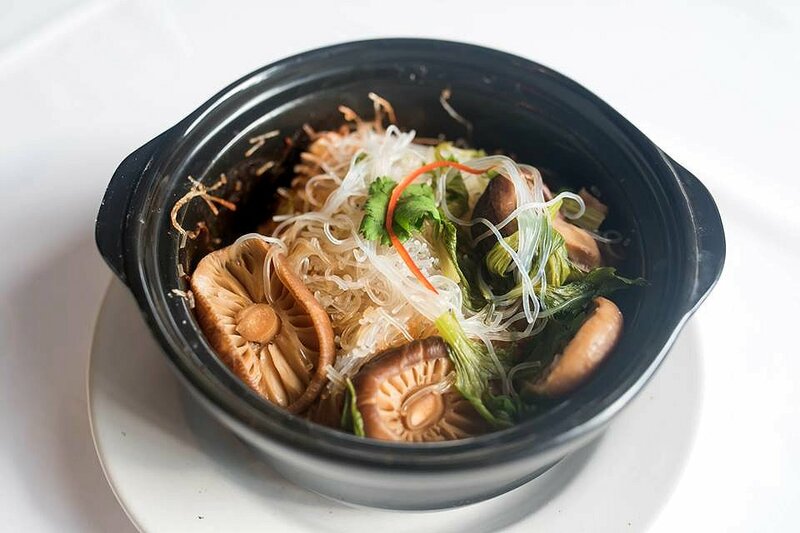 The glass noodles were soft and delicate, and the flavours of mushroom, pork broth and prawn juices were well infused. The mushrooms were soft and chewy, while the prawns were juicy and succulent. The flavours of nutmeg, cardamon, cinnamon spiced apple and peach in the riesling provided good contrast to the Asian flavours in the dish. 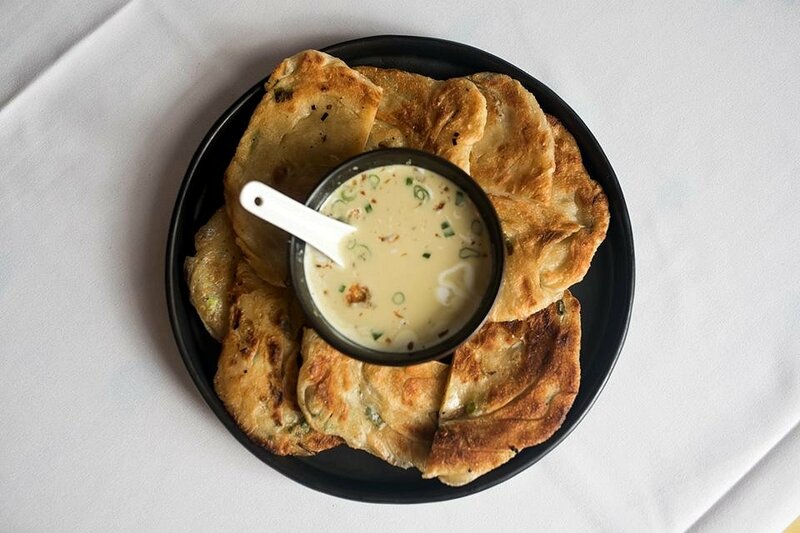 The Southern Style Roti served with green curry sauce was matched with the Tripelpunkt Eden Valley Textural Riesling 2015. The freshly baked roti was firm with a pastry like texture. It worked well in soaking the juices of the mild curry sauce that had a light consistency. Again, the taste of apples and mandarin in the riesling provided good contrast to the dish. 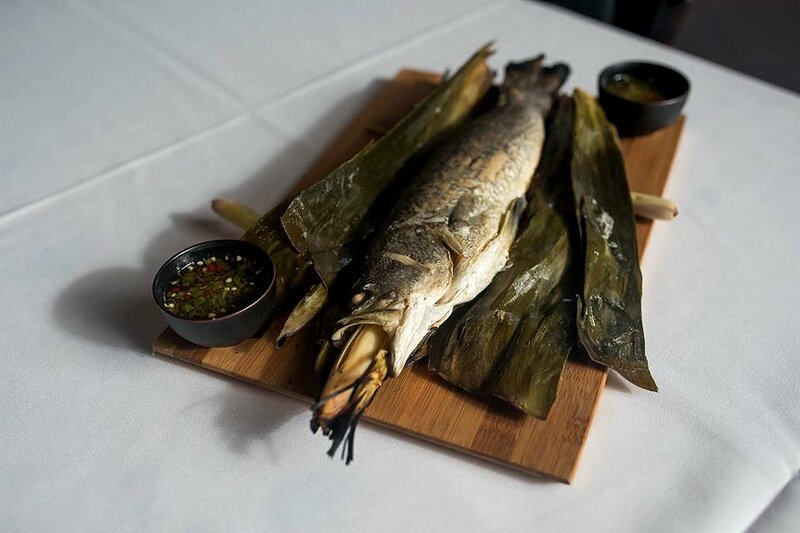 The Banana Leaf Wrapped Whole Fish was served with lemongrass and fresh chilli dressing. The fish was soft and delicate, and the flavours from the lemongrass and banana leaf were well infused. The chilli dressing wasn’t too spicy and added good depth to the dish. 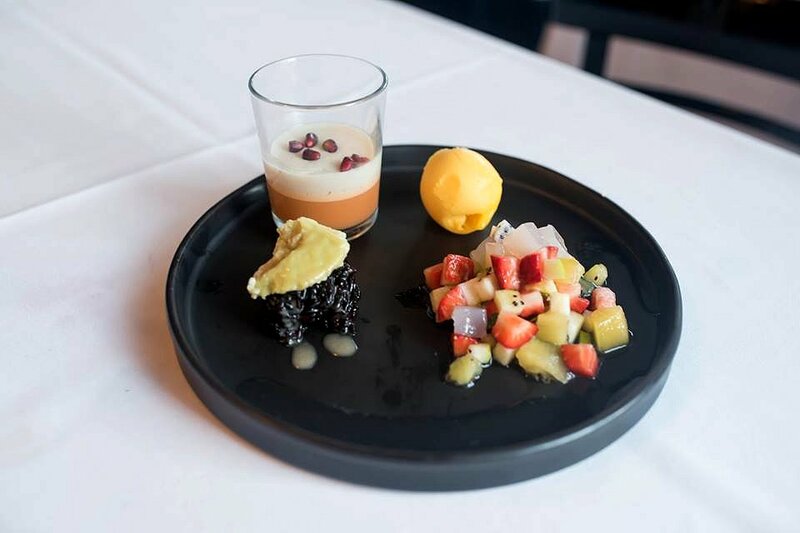 Paired with the Dufte Punkt Eden Valley Single Vineyard Aromatic Field Blend 2015, the flavours the mandarin and lychee complemented the Asian flavours in the dish. 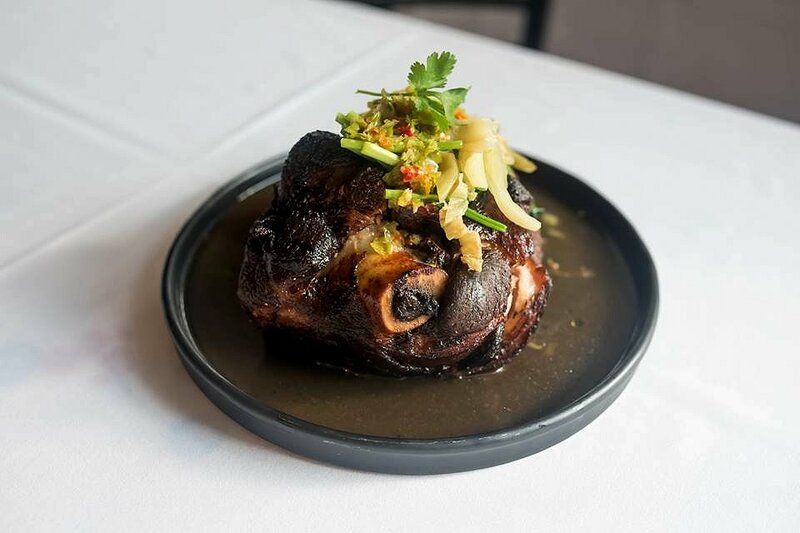 The Slow Cooked Pork Hock was served with pickled mustard greens and Asian broccoli, and paired with the Battle for Barossa La Conquista Tempranillo, Garnacha and Graciano (TGG). The pork hock was slow cooked for hours and then thrown in for a deep fry before serving. The exterior was crisp and full of flavour, however, we did find the meat on the inside a little dry. The flavours of dark cherry and cola in the TGG were very similar to the flavours in the dish. 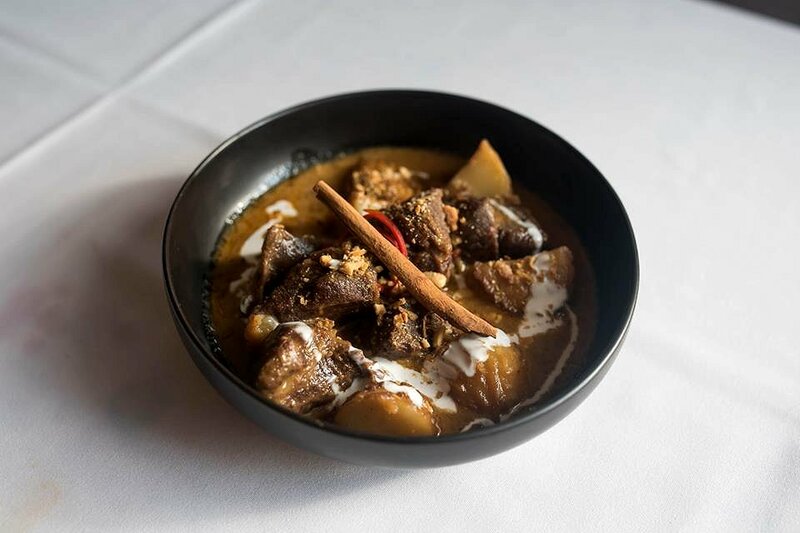 The dish of the day was the Mussuman Curry with Limestone Coast grass fed beef cheeks, potato and carrot. The beef cheeks were tender and succulent, and the meat simply fell apart. Cubes of beef or lamb are normally used but are never as soft and delicate as this! The curry sauce had a thick consistency and the flavours were just right. A life changing dish! The curry was paired with Battle for Barossa La Resistance Grenache, Syrah and Mourvedre (GSM). The GSM has a delicious fruity flavour that complements the sweetness of the curry. 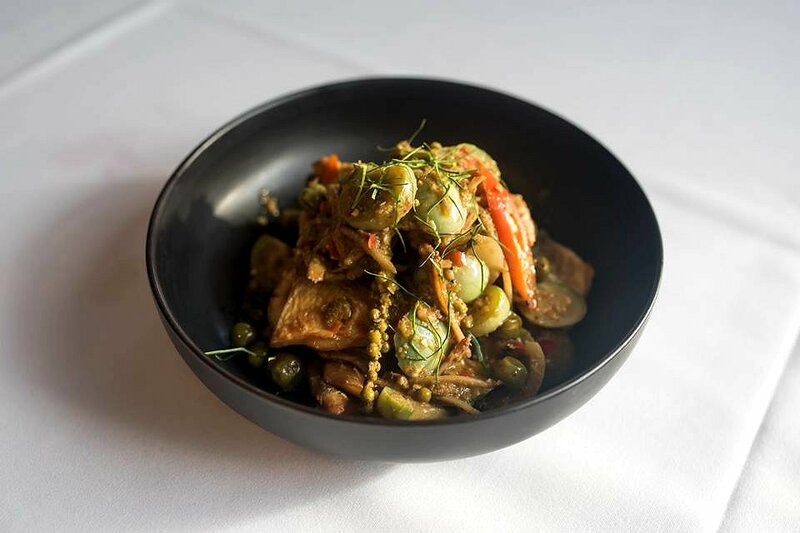 The Crispy Fried Coorong Mullet Fillet is cooked in a red curry paste with green peppercorn, krachai, chilli and pea eggplant. This was matched with the Evangeline Eden Valley Single Vineyard Syrah 2014. Underneath the top layer of exotic Asian ingredients were crispy fried fish fillets that were immersed in the flavours of all the spices. The fish was tender and succulent, and the sauce was hot and peppery. It was cold and wintery outside, but you wouldn’t be able to tell after eating this dish. The flavours of black berry and peppercorns in the syrah complemented the spiciness in the dish. 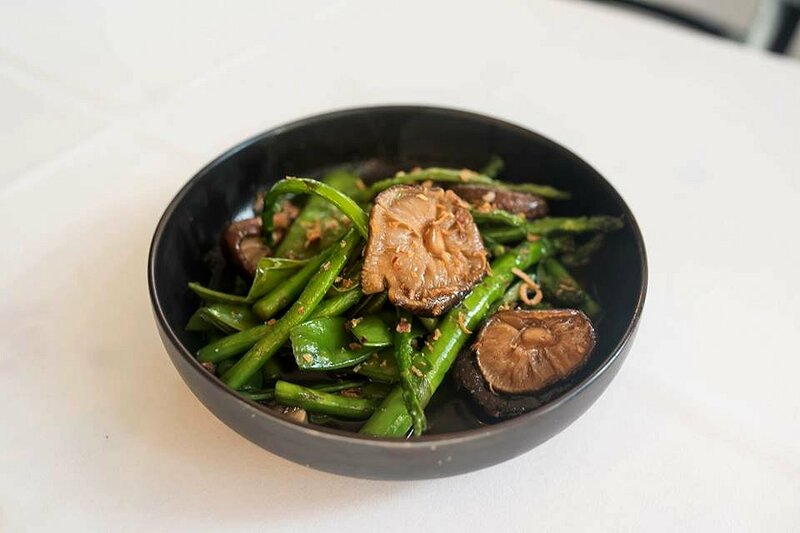 The Stir Fried Asparagus in oyster sauce and shitake mushrooms was paired with Synonymous Barossa Shiraz 2014. The asparagus was firm and well cooked, however, we felt the star of the dish were the mushrooms. They acted like a sponge and soaked up all the juices from the oyster sauce. They were so juicy and flavoursome, each bite was like a party in your mouth. The shiraz had flavours of dark fruit and chocolate which provided good contrast to the dish. We finished off the pairing with dessert which was the Sticky Rice Pudding with custard, fruit salad and mango sorbet. Also on the plate was a Thai Iced Tea Panna Cotta with coconut jelly. The dessert was matched with the Superbarossa Shiraz Cabernet Sauvignon 2014 and Elijah 2015 Ex Barrel. The sticky rice had a firm chewy texture and had a green topping that was similar to a unsweetened creme caramel. The fruit salad was light and refreshing, as was the mango sorbet. The panna cotta was more of an acquired taste with flavours that were interesting. The cabernet sauvignon had sweet flavours of plum and strawberries which were ideal for a dessert. Let us tell you that the food and wine pairing at Soi 38 is both a memorable and satisfying experience. Come to the venue hungry and keep the entire afternoon free. The food and wine partnership with Chaffey Bros. will continue for the month of July. After that, the #notyouraveragelunch series will continue as Soi 38 partners their food with other small wine producers. Adelaide Food Central would like to thank Daisy, Terry and the staff at Soi 38 for their hospitality, and Chaffey Bros. for their delicious drops.